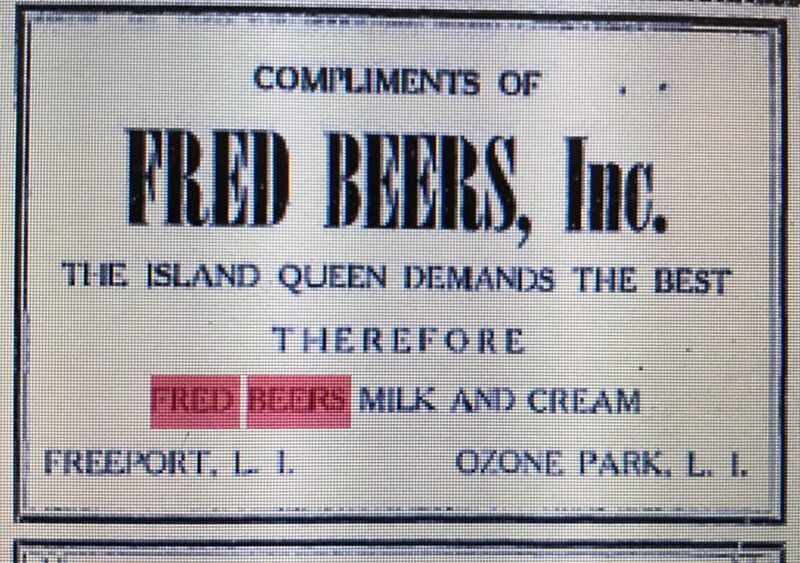 Fred Beers, Inc., Ozone Park, L.I. Census records show Fred Beers immigrating to the U.S. from Germany in 1906. In 1910 he was living on 118th Street in Manhattan and listed himself as the driver of a milk wagon. By 1920 he was living in the Bronx and simply called himself a milkman. In 1930, he was living in Brooklyn and was the proprietor of a milk company. Fred Beers, Inc. maintained facilities in both Ozone Park, Queens and Freeport, Long Island and started sometime around 1930. The first listing for Fred Beers, Inc. in Ozone Park that I can find is in the 1931 telephone directory at 101-11 100th Street, where it remained through 1953. In Freeport, the business was listed at 176 N Main Street in 1930 and 25 Bennington Avenue in 1939 where it remained through at least 1950. A 1938 advertisement in the Patchogue Advance listed both the Ozone Park and Freeport locations. Sixteen milk companies in Brooklyn and Queens have agreed, up to today, to participate in the city relief milk program by which children under 16 years of age will get a pint a day free. The plan is sponsored by Mayor LaGuardia and the United States Department of Agriculture. In 1953 they moved the Queens location to 103-45 98th Street in Woodhaven. They remained there through at least the late 1960’s. In the late 1940’s the name in the phone listings changes from Fred Beers, Inc. to Beers, Inc. That’s an indication that Fred Beers may have left and/or sold the business around this time. Based on census records he would have been in his 60’s by that time so it makes sense. The 101-11 100th St location is a two story commercial building that could certainly date back to the business.The Bennington Avenue location is an open yard directly adjacent to the LIRR tracks. It looks like it could be one of the railroad’s construction staging areas. The bottle I found is a machine made quart embossed Fred Beers Inc. Ozone Park, L.I. This would date it between the business start-up in the early 1930’s and the name change in the late 1940’s. Previous Previous post: Hardscrabble Farm Dairy, East Hampton, N.Y.
Next Next post: George Hendrickson, Willow Dairy, Wantagh, L.I.